For those familiar with old LPs, Arco is a nation based upon Classical Greece in the early age - a nation full of skeptics, philosophers, with an interesting assortment of units. They are the nation I played in my first ever game of Dom3, wherein I attempted to wield sacred Pegasi, running a Water 9 blessing to make them really fast, with some astral and nature for magic resistance and regeneration. For simplicities sake, a score of '10' in a stat is what an average human would have. A score of 14-18 would be in the range of good/very good, and anything 20+ is usually pretty damn great. He has 43 defense. That is an insane quantity. Said defense is the proud result of stacking a ton of stats, and a great deal of serendipity in his heroic ability. These days I still always try for doing what is cool, but it almost always has an ulterior motive of winning behind it. First, Arco is weak to earlygame rushes. Although the virtue isn't very powerful to start off with, with a bit of research she can cast extremely powerful self-buffs which make her a one-angel army, and a powerful deterrent. Second, my nation has a passive ability where all provinces in my Dominion get automatic intel reports that are fairly accurate. One's pretender is one of the single most powerful sources of Dominion spread, so an awake Pretender will cause that information to flow much sooner. As for the scales, all those positive & negative income scales eventually multiply out to approximately 90% of base income - plenty for my purposes. Order is simple : More money. 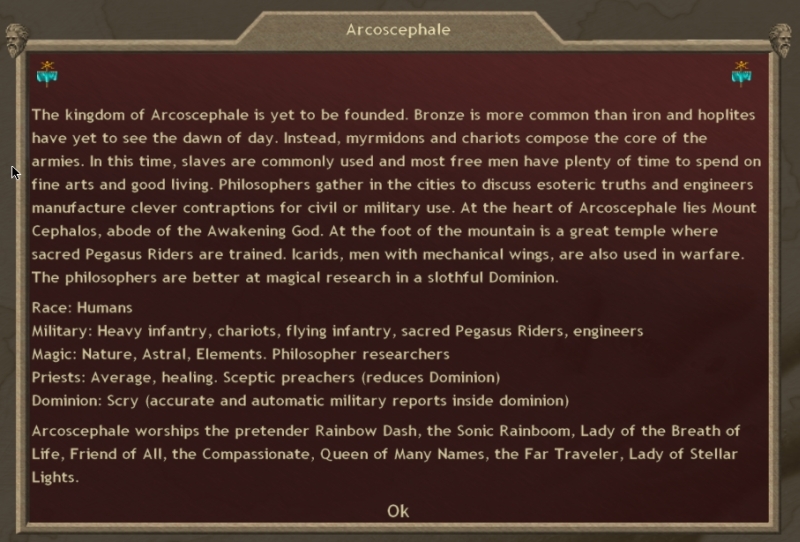 Philosophers are cheap, and in my Dominion are worth 9 RP/turn for a mere 50 gold. Downsides are that they are old, have no magic, and capital only - meaning they have some use early game, but rapidly taper off. However, what they enable me to do is get those buffs done sooner while spending my gold on troops, and taking an early, hopefully commanding research lead. Cold is a metagaming choice - Mictlan & Hinnom both like heat, nobody particularly likes Cold, so an Icy dominion can be a slight invasion deterrent for some. That, and I want the design points to throw on Growth. 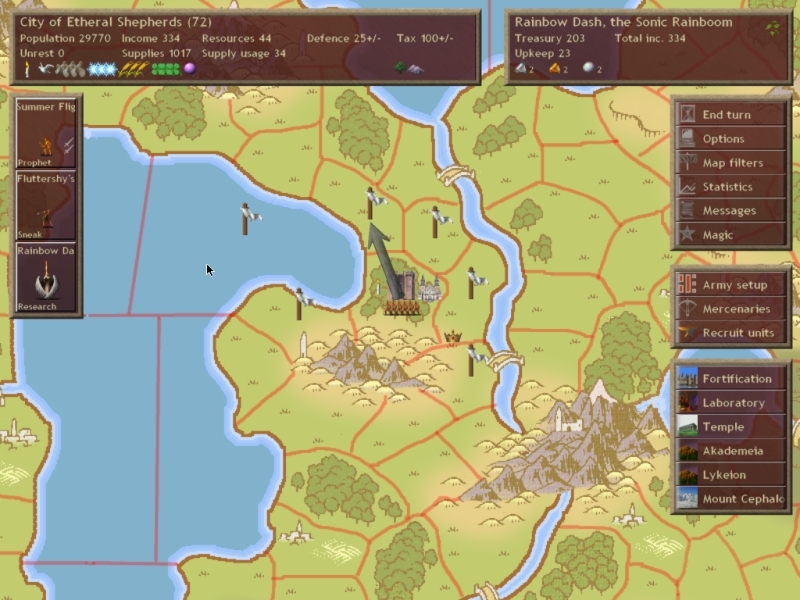 Growth isn't that great in vanilla, but taking it enables some nice random events and will result in a long term rise in my income - which can be quite helpful lategame until someone decides to plague bomb you. Luck is easy : Luck means good events. Good events mean magic gems. Magic gems are what wins the game. Luck also means free gold events, which will go a long way towards helping my reduced income, although it's unreliable and could shoot me in the foot. Magic, lastly, means my researchers have just a little more oomph. I make my starting commander my prophet - he'll spread more dominion and gain access to the Smite spell, which will make him useful in early expansion. Furthermore, attacking blind is usually an awful idea, as it runs a high risk of getting you murdered. 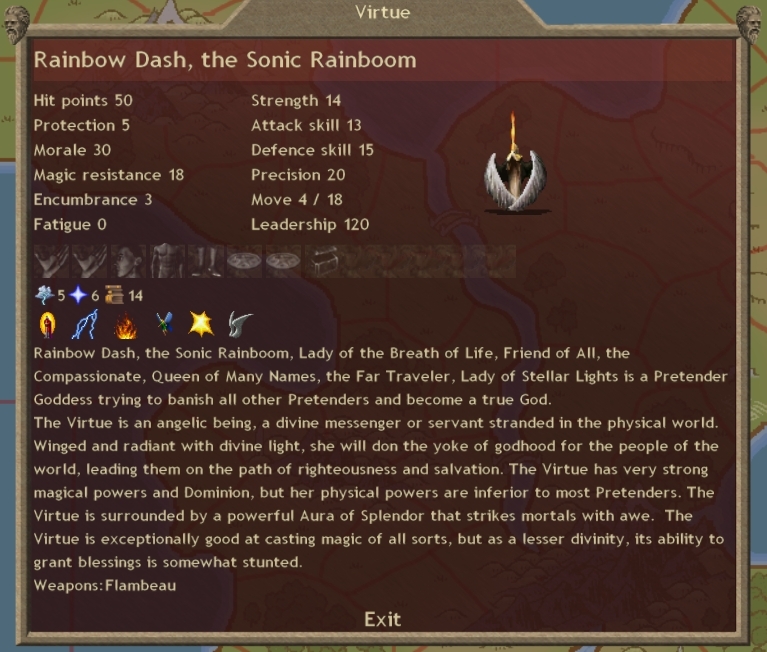 Rainbow is set to research something I want - an early leap in the graphs will both cause people to think I'm running a Rainbow Pretender rather than a hybrid mage/combatant, and get access to things just a little bit sooner. 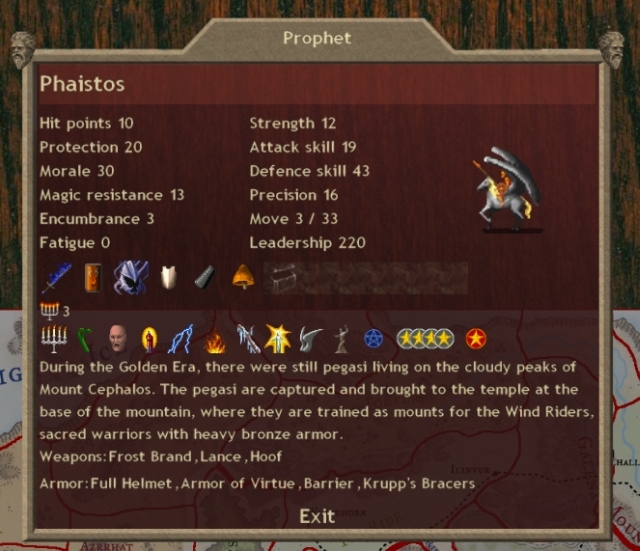 The top units are Peltasts - Lightly armored troops who have Javelins and shields. They're not particularly good at anything, but in the early age a lot of units are vulnerable to ranged weaponry, and the Peltasts throw those javelins twice before closing into melee, which can help reduce casualties considerably. 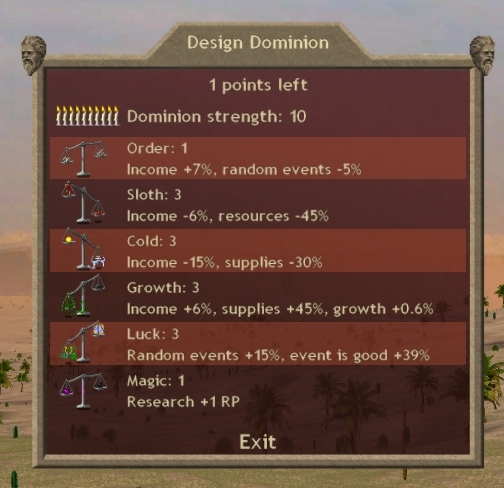 The bottom units are Cardaces - no ranged weapon to speak of, but better melee stats. 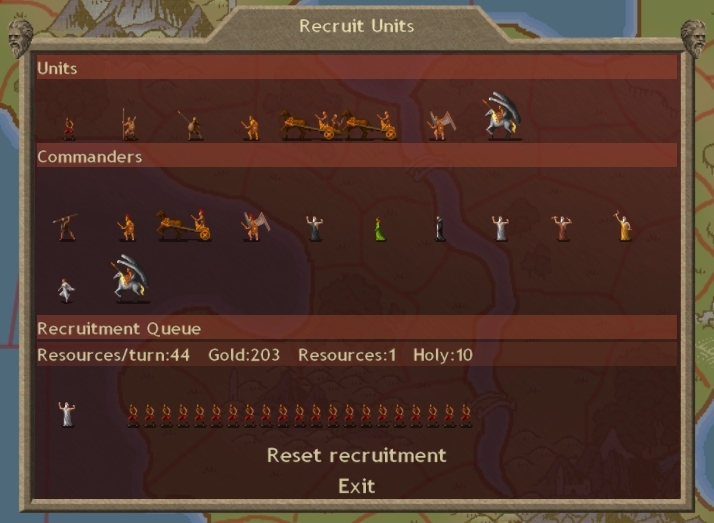 I will probably never recruit more; their use is as damage sponges, as can be seen from the positioning of my troops. 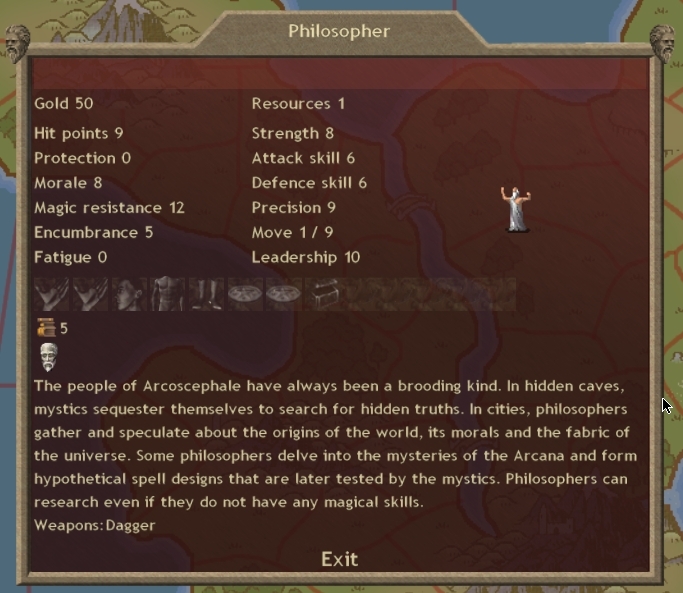 I then recruit a Philosopher and a load of slingers - Slingers are extremely cheap, fairly bad ranged troops, whose only advantage is that being extremely cheap - so I can get a -lot- of them. 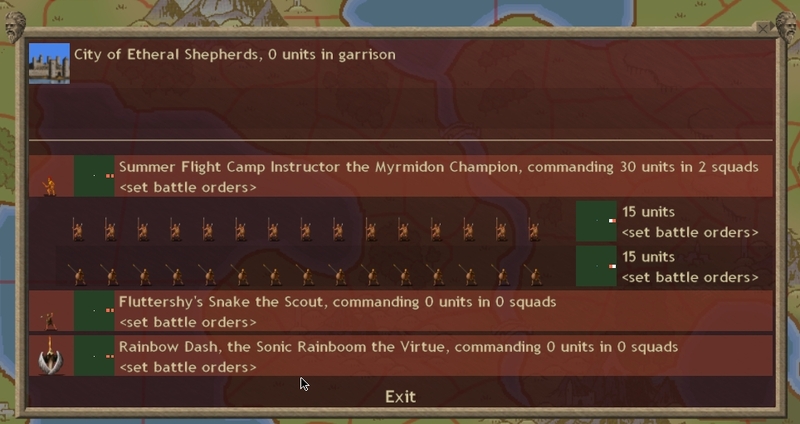 Combined with my other units, it forms a squad that can take out a considerable number of independent provinces before needing to return home to recruit more, so long as they attack intelligently - charging into cavalry, for example, is a good way to get demolished.